This is a wonderful appetizer that is easy to prepare and is gluten and dairy free. You can use pork tenderloin or boneless, skinless chicken breast in place of the beef if desired. Served warm, this is a great appetizer to impress friends and family. 1. 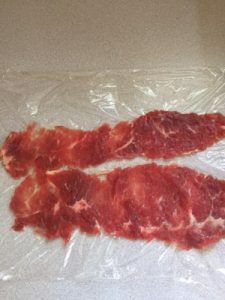 Place the beef slices on your work surface and cover with plastic wrap. Pound very thin. 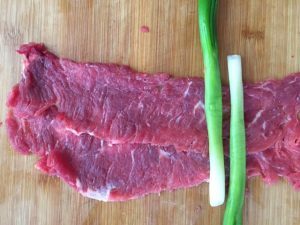 Lay two scallion on each beef slice, trimming the ends of the scallions to fit the meat. 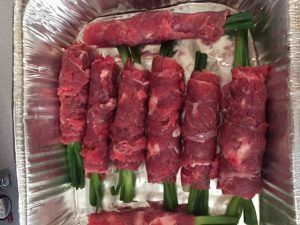 Roll into a long roll and place them seam side down on a baking sheet. 2. 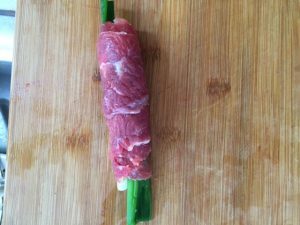 Combine the marinade ingredients in a small bowl and pour over the rolls. 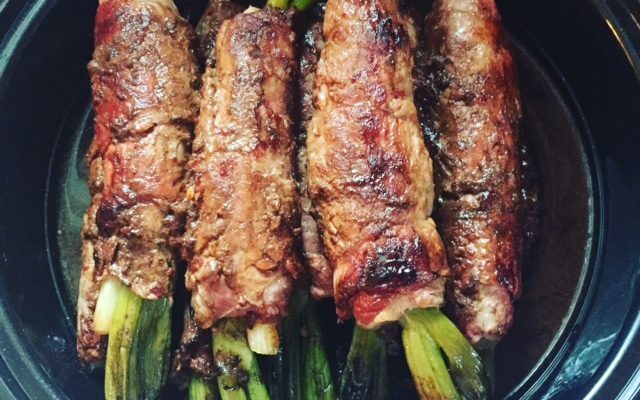 Marinate at least one hour or overnight in the refrigerator. 3. Heat a large skillet over high heat until hot but not smoking. Lower the heat to medium and add the tablespoon of oil. Add the rolls allowing the marinade to drip off. Sear the meat on all sides for a total of 4 to 5 minutes. Transfer the rolls to a cutting board. 4. Add the marinade to the skillet and bring to a boil, cook for a minute and then remove from the heat. 5. Slice the rolls into 2 inch pieces and place on a serving dish, pour the sauce over and serve.